Our luggage was damaged during our last trip. KLM issued us a document to get it repaired in a shop in Nantes. With the nice weather, we decided to go yesterday. The shop was right in front of the Galerie LaFayette. Surprisingly, we had to pay from our pocket first for a new luggage and then get reimbursed. The shop has to make an estimation of what our old luggage is worth in order to give us an equivalent one. 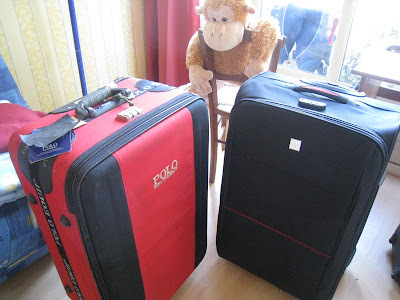 Without even looking whether the luggage could be repaired, the shop seller told us to choose something worth 90€. Actually the new bag was having a 30% discount but the shop owner wanted to charge us and eventually KLM the original price. We didn't let it happen. We insisted that they wrote down the price after discount. 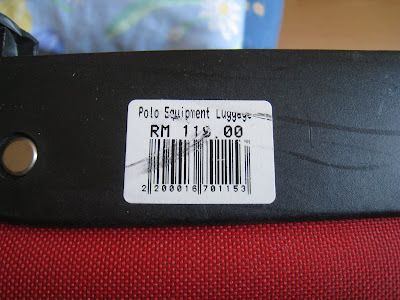 When I had a close look, the price tag of my old luggage bought in Malaysia was still there. And it cost me RM119, around 26€. So the same bag in Malaysia costs around 3.5 times more in France. This makes me curious, what other Malaysia products are worth in France. 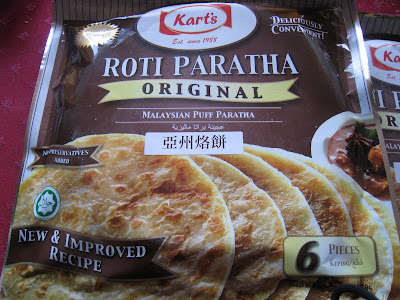 Frozen roti canai is something we can find in some Asian grocery stores. One piece costs 0.50€ or around RM2.25. Unfortunately we won't be able to eat any roti canai at 0.50€ a piece in any restaurant in France. 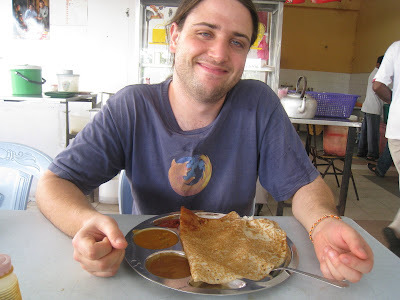 That was why hubby was happily enjoying his roti telur bawang (egg+onion) or dosai with different kind of curry sauce at RM1 many morning when he was in Malaysia. Our rice cooker was broken and I had wanted to buy one in Malaysia. With the space concern I eventually gave up. Yesterday I went to the Asian shop and I regretted immediately that I didn't buy it back home. A crappy rice cooker here costs 37€ = RM166,5. With this price I can buy a fancy big one there. After thinking about it, all these make sense. It is not surprising that a product will be sold at 3 or 4 times more when it enters France. Beside the transportation cost, it needs to add on to all kind of social taxes (unemployment, retirement, medical care, education...). At the end of the day, the French enjoy many social protections, but they lose on purchasing power, and most importantly, the dynamic of their economy. A French who wants to set up a company will have to bear 3 or 4 times costs or risks more compare to a Malaysian. A friend (Chinese) is opening a shop here and he is asked to pay all bunch of taxes/guarantee fees before even selling an item. With the high cost, less people will want to set up their own company, and eventually less job creation. The balance of social protectionism and economic dynamism has been a challenge to this country. We made it to Mount Kinabalu!